YVR welcomed Virgin Atlantic's first Vancouver flight on May 24, 2012. Virgin Atlantic announced today it is cancelling its Vancouver-London route. 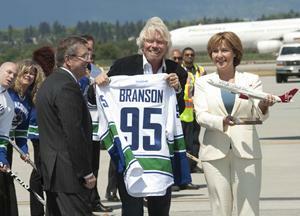 The airline launched its only Canadian flights to London Heathrow to great fanfare, with Premier Christy Clark joining Virgin founder Sir Richard Branson at Vancouver International Airport two years ago. It will continue its scheduled summer service (May-October) until next month, with the final flight scheduled for October 11. This new route initially saw its weekly flight frequency boosted from four to five in 2013 after seeing an 18 per cent increase in passenger volume. at Virgin Atlantic Airways Ltd., says there are no job losses for the company in Vancouver, where it has one contracted employee managing sales and an outsourced airport team.